Sea Brook Place is a gated community that sits in between the Intracoastal waterway and the Atlantic Ocean, off of US1 and South of Indiantown Road. This condo community consists of 176 units that range in size from 1,200 to 1,600 square feet and two to three bedrooms. Residents are just steps away from the beautiful Jupiter beaches, accessed by a private beach path. Sea Brook place is centrally located close to shopping, restaurants, the Jupiter River Walk and the Maltz Theater. Carlin Park is just a stone's throw away, where residents can enjoy the fitness trails, amphitheater and tennis courts. Short sale subject to lender approval. Amazing location! Close to everything Jupiter has to offer - restaurants, shops, parks, and the beach! 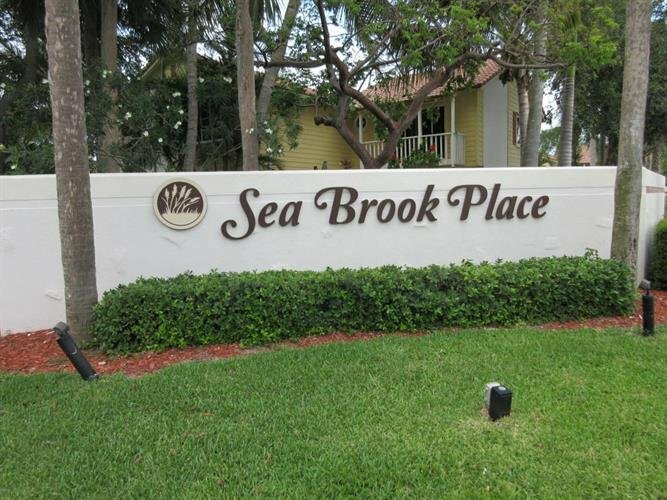 Sea Brook Place is a gated community East of US1 with low condo fees, featuring its own private pathway leading to the beach. Two pets allowed with no size restrictions, some breed restrictions.